Russia experienced tremendous sociocultural conflict in the early 1860s. In 1861, serfs were liberated and the resulting economic shifts radicalized a number of Russia’s younger intellectuals. In 1863, fourteen students at the Russian Imperial Academy of Arts refused to participate in the annual gold medal competition because they felt the required subject, “The Entry of Odin into Valhalla,” and the Academy’s continued insistence on the supremacy of history painting was completely irrelevant to contemporary Russian life. Rejecting the Academy had consequences; it meant rejecting the major patron in Russia—the tsarist government. As a result, a number of these artists were compelled to create their own exhibitions, when they could gain permission, in order to produce the income necessary to pursue their careers. In 1870, a number of like-minded artists formed The Society for Traveling Exhibitions (Obshchestvo peredvizhnykh vystavok), and became known as the Peredvizhniki or Передви́жники (sometimes called The Wanderers or Itinerants in English). This society had as its goals not only to create art that presented an unvarnished representation of contemporary life in Russia, but also to bring art out of the capitals and into the countryside—to the people—to create an art for the nation. The first Peredvizhniki exhibition opened in St. Petersburg in November 1871 and then traveled to Moscow in early 1872. It was met with immediate acclaim by powerful critics such as Vladimir Vasilevich Stasov, who proclaimed it the dawn of a new day for Russian art. The early Peredvizhnki’s exhibitions were a curiosity—the first exhibition traveled to only four cities, but had a total of 30,527 visitors—but by 1877, the exhibitions were genuinely popular and attracted over 40,000 visitors a year and traveling to a eight or more cities. Some Peredvizhniki canvases were overtly political, such as Ilia Repin’s monumental, Volga Barge Haulers, which portrayed the inhumane conditions under which these men worked, but most were not. Many of the Peredvizhniki gained fame for their depiction of the Russian land. The concept of the native land, rodina, had always been a significant factor in the conception of Russian national identity, but was rarely depicted in the fine arts. 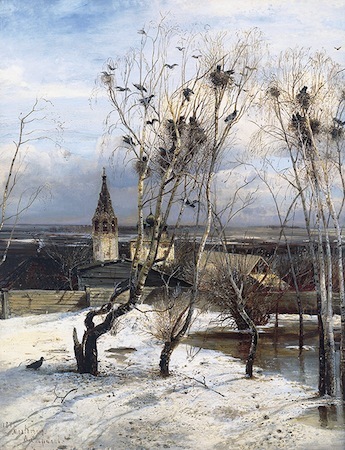 Aleksei Savrasov’s The Rooks Have Returned (Grachi prileteli), 1871 caused a sensation for its sensitive portrayal of the Russian countryside. In addition, Ivan Ivanovich Shishkin’s depictions of the Russian forest and Arkhip Ivanovich Kuindzhi’s dazzling images of moonlight nights in Ukraine celebrated the beauty of the diverse regions of the Russian Empire. Despite the popularity of landscape subjects with the art buying public, critics charged that landscape painting could not advance progressive political agendas and that it was an elitist art for a leisured class. Stasov and other critics demanded that landscapes include social commentary and put on view the hardships of life in the country. 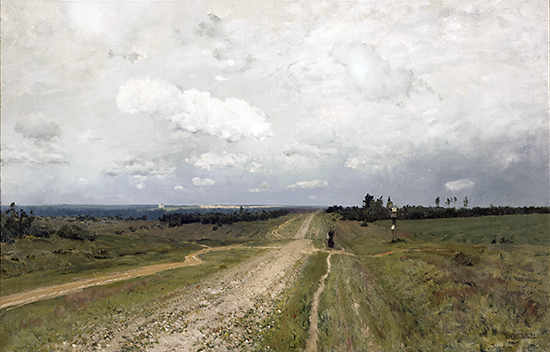 Isaak Levitan’s Vladimirka Road is one example of an attempt to respond to these charges by infusing landscape painting with political content. This seemingly unassuming landscape would have been recognized by the majority of Russian viewers as the road along which prisoners were marched to exile in Siberia. During the second half of the 1880s, the Peredvizhniki gradually lost their status as a progressive opposition group. 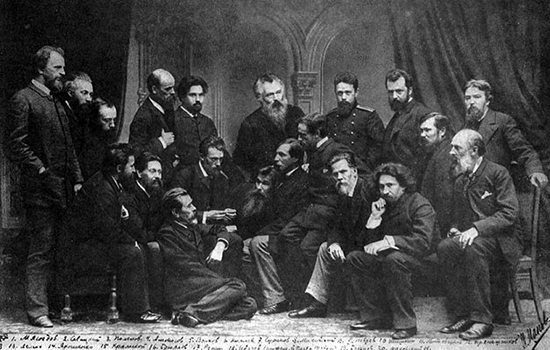 The tsar’s family began attending exhibitions and purchasing pictures and members of the Peredvizhniki, such as Repin and Vasilii Dmitrievich Polenov, were even invited to join the Imperial Academy of Arts, the very institution against whom many of the Peredvizhniki had rebelled just 20 years prior. Younger Russian artists were put off by the Peredvizhniki’s increasingly restrictive membership policies and turned to both indigenous art traditions and contemporary Western art practice to forge a path for modern Russian art. In spite of this institutional acceptance, the Peredvizhniki continued to exist as an organization until 1923. Some members then joined the Association of Artists of Revolutionary Russia (Assotsiatsiia khudozhnikov revoliutsionnoi Rossii). Subsequently, Soviet critics recast the Peredvizhniki as politically progressive, hailing them as precursors to Socialist Realism. Cite this page as: Dr. Kristen M. Harkness, "An Introduction to The Peredvizhniki (The Wanderers)," in Smarthistory, August 9, 2015, accessed April 24, 2019, https://smarthistory.org/an-introduction-to-the-peredvizhniki-the-wanderers/.